After the initial fanfares, few veterans were greeted by orchestrated celebrations. Leningrad’s returning veterans faced a bleak situation. Here, more than anywhere, demobilization was anything but a return to normality. Few cities have confronted a postwar legacy as traumatic as that in Leningrad. The Siege of Leningrad, known locally as the blockade (blokada), killed approximately a third of the city’s prewar population, and destroyed twenty per cent of its housing and much of its infrastructure. Veterans experienced many difficulties in returning to their homes, families and jobs. Readjusting to civilian life in this war-ravaged society was more challenging than many veterans could ever have imagined. Normality was difficult to find in a community traumatized by a unique wartime experience. For Leningraders, officials and civilians alike, reintegrating this rapid influx of returning soldiers represented an enormous political, economic, social and cultural challenge. The Great Patriotic War (as Russians refer to the war on the Eastern Front between 1941 and 1945) was an extremely violent, even murderous conflict.7 It exposed soldiers to years of hardship, privation, killing and extreme violence. The majority of veterans, including many young and impressionable men and women mobilized straight from the school bench, had been exposed to years of privation and violence, and had witnessed and participated in deeply traumatic events. In the case of Leningrad’s veterans they were returning to a community with arguably an even more traumatic wartime experience. Leningraders had been on the frontlines of the war, exposed to the horrors of modern warfare, and witness to mass death.8 The Siege of Leningrad was a catastrophe for the city and its people. Official figures calculated 16.747 deaths from bombs and shelling, and 632.253 deaths from starvation and associated illness.9 Researchers have suggested a death toll closer to one million people.10 It was not simply the number of deaths that was shocking, but also the nature of them. In the winter of 1941/1942, the worst days of the blockade, death was part of everyday life: something remarkably universal. Besieged Leningraders watched their friends and family wither and die, their own bodies shrivel, and the world around them shrink, as survival and the search for food became the overriding priority. Reserves of energy and food were quickly exhausted, ersatz foods developed. Pets were eaten, soup made from wallpaper paste, leather was chewed, and in extreme circumstances, the starving resorted to cannibalism. Corpses were abandoned in apartments, stacked up in basements, or left on the streets where they had fallen. Survivors of these frightening events were physically and mentally exhausted by one of the most traumatic civilian experiences of the Second World War. This paper explores an extreme case of the difficulties of demobilization, and the challenges of adapting to civilian life experienced by returning veterans. It focuses on the disorientating and uncomfortable aspects of demobilization faced by the influx of veterans to Leningrad. Many aspects of veterans’ transition to civilian life could be interpreted as traumatic, at least in the twenty-first-century understanding of the word. This paper argues that Leningrad’s veterans proved remarkably adaptable and resilient in the face of the many and varied obstacles placed in their way. Although there were veterans who experienced psychiatric and psychological trauma, which were recognized as such by psychiatrists, most veterans found practical or psychological ways of coping with the problems they encountered. As a result, this paper also reflects on the meaning and understanding of trauma in late Stalinist Leningrad. This research comes out of a more extensive book-length study examining the many and complicated processes by which Leningrad’s veterans were turned back into civilians.11 A number of previous studies have highlighted the importance of demobilized veterans to understanding late Stalinist society. Elena Zubkova was amongst the first scholars to explore Red Army veterans’ difficulties readjusting to civilian life. Zubkova stressed that veterans were an important social group, whose experience shaped the postwar atmosphere, and who were critical to understanding the period’s social history.12 Amir Weiner has written persuasively about the sense of assertiveness and confidence that the war generated amongst veterans. Weiner’s research is not primarily an examination of the difficulties of demobilization or postwar adaptation, but it makes an important contribution to understanding how war reshaped the ideology, beliefs and practices of the Stalinist regime.13 Mark Edele’s landmark study of Soviet Second World War veterans firmly put veterans and their demobilization onto the research agenda, and provides the most detailed, authoritative and rounded portrayal of Soviet veterans to date.14 Edele traces the emergence of veterans as a social group and movement over a period of nearly fifty years. Leningrad’s veterans, however, have not received extensive attention, despite the unique situation facing the city and its environs.15 As soldiers, who had often been little more than civilians rapidly pressed into uniform with limited military training, sought to resume civilian lives, they encountered civilians militarized during the war, who felt they had also served on the frontlines. This created conflicting and sometimes competing postwar entitlements, as well as differing notions about, and attitudes towards, difficult and traumatic wartime experiences. Readjusting to civilian life in Leningrad amidst the wreckage of war and a traumatized community created a series of additional challenges for veterans, which merit special attention. Leningrad is, therefore, an important location for thinking about the relationship between former soldiers and civilians, and how trauma was conceived and constituted in late Stalinist society. For many of Leningrad’s veterans the process of “coming home” was a disorientating and confusing process. Although the journey home could be lengthy, uncomfortable and even dangerous (what Mark Edele refers to as the epic of return), the real difficulties began once veterans reached their final destination.16 The sudden freedom of civilian life could be destabilizing for veterans who had spent years in the armed forces, where the routines and structures of daily life were predetermined. Furthermore, demobilization meant that soldiers were suddenly cut adrift from their friends, comrades and the collectives which had sustained them throughout the war. Close relationships forged at the front amongst soldiers with shared experiences of extreme violence and mass death provided a ready-made support group for combatants. However, veterans would have to tackle the new challenges of readjusting to civilian life without these support mechanisms. Leningrad’s unique wartime experience had changed the city fundamentally. Landscapes, the people that inhabited them and the behaviour of civilian Leningraders were no longer the same. Defending home and hearth were important wartime motivations for Soviet soldiers, and with the war finally over Leningrad’s soldiers were anxious to return home.17 Veterans understood that demobilization was going to be tough. As one Leningrad veteran, Evgenii Moniushko, put it, “[a]lthough everyone understood very well that they were going back to the hard labour associated with reconstruction and rebirth instead of ‘heaven’, and that there/might not be shelter or food, everyone yearned to return home”.18 The “home” that most soldiers, however, had left behind no longer existed. Veterans returning to Leningrad and the surrounding region were returning to a landscape ravaged by war. When John Steinbeck flew over the Leningrad countryside in 1947, at the start of a visit to the Soviet Union, it resembled a moonscape, scarred by trenches, pitted by shells and littered with burnt-out villages.19 Veterans from Leningrad’s rural periphery often found that the villages where they had once lived and worked had entirely disappeared. In their case, there simply was no home to return to. Compared to other Soviet cities, Leningrad survived the war relatively intact. Indeed, foreign observers remarked that much of the city, particularly its historic centre, was remarkably well preserved.20 Much had been done to preserve architecturally important buildings and monuments, and reconstruction work began even before the blockade was lifted.21 While Leningrad’s veterans did not quite return to the urban wasteland that faced their comrades in, for example, Minsk or Stalingrad, the damage done to Leningrad’s housing was extensive. According to official figures 148.478 artillery shells, 102.500 incendiary bombs and 4.638 high explosive bombs were fired or dropped on the city.22 Approximately twenty per cent of Leningrad’s housing was destroyed. The most authoritative figures suggest that 3.174 buildings with a living space of 3.300.000 m2 were totally destroyed and 7.143 buildings were severely damaged, with a loss of 2.200.000 m2 of housing. A further 9.000 wooden buildings, many of them residential, were dismantled to provide fuel.23 Damage was not uniformly distributed across the city. While the city centre was relatively well preserved outlying districts in the north and west were devastated. The Kirovskii, Vyborgskii and Leningradskii raiony lost 65, 42 and 40 per cent of their housing respectively.24 Many veterans hardly recognized the neighbourhoods they had left behind. Leningrad’s veterans could not rely on returning to the comforting familiarity of their prewar homes. Nor could they always rely on being reunited with their families. Anna Krylova has written about the way in which families often served as healers of veterans’ wounded souls.27 Yet Leningrad’s veterans were not always in a position to benefit from the succour that families were capable of providing (at least in propagandists’ imaginations). First, many veterans no longer had families to return to, or the make-up of their families had changed dramatically. Veterans lost wives, mothers, fathers, brothers, sisters, sons, daughters and members of extended families to the cold and starvation. Death’s indiscriminate hand touched virtually every family. Secondly, many women, children and elderly citizens were evacuated from Leningrad either with industrial plants, or to remove them from the city. Although mass re-evacuation began before the end of the war, many Leningraders were unable to return to the city as quickly as they wanted. When the war ended evacuated Leningraders employed at industrial plants in the Urals frequently demanded to be sent back to the city as quickly as possible. It took many months or even years to negotiate a return, by which time demobilized veterans had already come back.28 Tracing family members spread across the Soviet Union (and in the case of the Red Army central and Eastern Europe), amidst the dislocation of the immediate aftermath or warfare was no mean feat. Thirdly, families which managed to survive the blockade and evacuation, and maintain contact did not always survive lengthy periods of separation. Families sometimes fell apart under the strains imposed by war. Soldiers, and their wives, met new people, experienced new things, and in a period of emotional turmoil sometimes began new relationships. Even when families were reunited, family relationships were not always a source of unconditional happiness. One example will have to serve here for many. Before the war, Fedor Gromov had lived with his wife and daughter. His wife died during the blockade, and in 1942 his daughter was evacuated from Leningrad with a factory training school. Turning eighteen in 1942, she left this institution and began travelling between cities supporting herself by minor crime. She was arrested in 1943 and sentenced to one year’s imprisonment. She continued to commit minor crimes following her release. After his demobilization in 1945, Gromov tracked down his daughter, now twenty, and brought her back to Leningrad. For a while she lived with her father, and worked at the Kalinin tram park. Before long, she moved apartments on the premise of being closer to work. But without the supervision of her father she quit work, and once again returned to crime, committing burglaries with a former friend who had lost both her parents during the war.29 When Fedor Gromov thought about postwar family life, he surely must have imagined a different future for his daughter. Leningrad was no longer inhabited by the same people to whom soldiers waved goodbye as they left for the front. Blockade survivors and evacuees were reshaped by their wartime experiences, in similar ways to which soldiers were influenced by their wartime experiences. Veterans found that family members and friends had changed, but perhaps more apparent was the change in the make-up of the city’s population. The loss of a third of the city’s wartime population had dramatic implications for the nature of urban life as well as the social and cultural atmosphere of the city. Mass death overshadowed life in postwar Leningrad. One effect was a pressing shortage of skilled workers and experienced administrators in virtually every sector of the economy; even the party and security service were forced to recruit inexperienced new members. It took years to fill the demographic hole and for its effects to be smoothed over. Leningrad’s repopulation and the replenishment of its workforce could not be achieved by re-evacuation and demobilization alone. Waves of rural migration were nothing new for Russia’s northern capital. Indeed, many of the veterans returning to Leningrad were themselves former peasants who had migrated to the city in the 1930s. Yet, another influx was necessary for the city’s gradual recovery. As the historian Blair Ruble writes; “[b]ehind the neo-classical and baroque facades of the Moika and Fontanka came to live, not dispossessed gentry and honoured revolutionary heroes, but one more generation of peasants in workers’ clothing”.30 Returning veterans now found themselves living and working alongside different people, who often had little connection to the prewar city. Propaganda created the impression that veterans returning to their former workplaces were returning to the familiar routines and collectives. Yet in reality, workforces were very different: they were often younger, dominated by women, and factories were often producing different products. The war also created new social groups, layers and consistencies, whose presence was felt in the postwar city. Veterans themselves were perhaps the most significant of these. But the appearance of a new generation of war orphans, itinerant disabled beggars and petty criminals were for many Leningraders particularly striking. Ex-servicemen were often struck by how much the community they had left behind had changed. In September 1946 a group of recently demobilized veterans living in a communal apartment at 26 Krasnaia ulitsia, in the centre of the city, wrote a collective letter of complaint to the editors of Leningradskaia Pravda, the city’s main newspaper. For these veterans the drunkenness and disorder which surrounded them was shocking, and provoked outrage. The postwar crime wave and the visible presence of so much of the human flotsam created by the war was clearly destabilizing and disorientating. Having fought to defend their community, city and nation many had envisaged a very different postwar society. Much else about the difficulties faced by returning veterans might be described as traumatic, from the misogynistic slurs faced by female veterans returning from the front, the dismissal of disabled veterans from their jobs, to the discrimination faced by former prisoners of war and veterans who had intimate knowledge and experience of life in the capitalist West, by virtue of armed service beyond Soviet borders. The loss of home, family and sense of community, the damage to veterans’ physical health, and their uncertain status in postwar society could, in one understanding of the word, be considered traumatic. Even after this most violent, destructive and traumatic of conflicts it was not predetermined that ex-servicemen would be unable to readjust to civilian life. Despite the rapid influx of former soldiers and the problems this created, the overwhelming majority of veterans settled down to civilian life with surprising ease. Despite all the obstacles placed in the way of Leningrad’s returning veterans the overwhelming majority successfully navigated the transition between war and peace. Most managed to pick up the threads of their prewar lives relatively quickly. Most were not brutalized or traumatized by their wartime experiences, and concentrated on the tasks of postwar reconstruction. Veterans were often angered, frustrated and disenchanted by the difficulties of demobilization, and often deeply resentful of the failures of the state to adequately support their transition.37 However, it would be mistake to confuse strong negative emotions with trauma. Leningrad’s veterans proved to be highly adaptable and resilient in the face of the many difficulties and frustrations of demobilization. They explored their own avenues for obtaining work and housing, often independent of official distribution mechanisms. Some of these solutions were entirely legal; others pushed veterans towards the shadow economy, informal practices and corrupt networks. Knowing that they had come through the Great Patriotic War, perhaps the ultimate test, veterans often found the difficulties and frustrations of demobilization more manageable. This, however, is not to diminish the genuine psychological trauma experienced by Leningraders. There were of course both demobilized veterans and blockade survivors (blokadniki) who experienced psychological and psychiatric difficulties in connection with or response to their wartime experiences. Psychiatric casualties of modern warfare were a medical and social reality in postwar Leningrad, which archival records sometimes situate amidst the city’s postwar landscape. Trauma never entirely disappeared from view within the city, despite the stigma and ideological complications presented by wartime psychiatric breakdown. A number of psychiatrists based in Leningrad who were particularly interested in war trauma amongst both soldiers and civilians, examined these problems in their research and published books and articles exploring these issues.38 For example, the editors of the volume exploring wartime military psychiatry in the official medical history of the Great Patriotic War were military psychiatrists with links to Leningrad’s Military Medical Academy, an institution which invested great effort and energy in studying trauma.39 Furthermore, a particularly active, productive group of researchers at the Bekhterev Institute wrote and published a prolific number of papers exploring trauma amongst soldiers and civilians during and after the war.40 Academic study was one thing, widespread understanding and recognition of trauma amidst a wider public was another entirely. Soviet society as a whole understood trauma in very different terms to contemporary Western Europe. A society which had been through war, revolution, civil war, famine, collectivization and mass political terror in a period of over thirty years had inevitably developed its own attitudes and position towards trauma. Few veterans were recognized as trauma cases. Only the most severe cases of psychological trauma stood much chance of treatment. The number of veterans who were recognized as disabled, either for psychiatric or psychological reasons, was a tiny percentage of disabled veterans, and an even smaller percentage of veterans as a whole. Most veterans found their own ways of coping with nightmares, flashbacks and similar symptoms. No doubt some veterans suffering from mental health problems presented to doctors with physical symptoms. Occasionally psychiatrists attributed the postwar growth in illnesses such as stomach ulcers, hypertension and heart problems to veterans suffering from psychological trauma but presenting to doctors with physical symptoms. The social stigma attached to mental illness in Soviet society and prevailing conceptions of masculinity meant that veterans sometimes “somaticized” psychological problems, turning them into physical illnesses of ailments.41 Veterans, families, neighbours, colleagues and the wider community all found alternative ways of dealing with the potentially damaging effects of war. Leningrad’s veterans, despite the horror of their wartime experiences proved remarkably successful in avoiding debilitating trauma. If, however, we are prepared to accept that social circumstances and culture played a role in how trauma was mediated, interpreted, understood, treated and diagnosed, then we should also countenance the role local social and cultural factors may have played in shaping trauma. The Soviet Union despite the popular cliché was never quite the uniform monochrome society that the totalitarian module and Cold War rhetoric would have had us believe. Different parts of the Soviet Union, and even Soviet Russia, had very different wartime experiences which created very different social circumstances, economic conditions, cultural priorities and political responses. If we accept this we should be prepared to explore the idea that part of the reasons for Leningraders’ adaptability in the face of “traumatic events” was the city’s own unique wartime experience. Veterans who returned to societies which had little direct experience of the wars they returned from, often faced some of the worst difficulties, with disaffected and traumatized combatants unable to fully reintegrate into communities which seemed alien, and incapable of understanding or appreciating their experiences. Leningrad’s soldiers and civilians had different wartime experiences, but both groups were on the frontlines of the war. Leningraders understood the realities of war better than most. If anything, it was harder for soldiers to understand life in the blockaded city, than vice versa. Although the result was not a widespread appreciation of trauma, at least in the terms in which psychiatrists understood it, there may have been a greater tolerance towards social behaviours which we might attribute to trauma. Excessive drinking, angry outbursts, and heightened emotions, all of which were regularly observed amongst veterans, were not linked to trauma or even seen as particularly problematic. Leningrad was, of course, a special case. Demobilized veterans returning to the city faced an extremely difficult transition to civilian life, which was very different to other parts of the Soviet Union, in particular to cities deep in the Soviet rear. Veterans who returned to Cheliabinsk or Khabarovsk were not re-joining a society traumatized in the same way, or to the same extent as Leningrad. A case study of how veterans dealt with the challenge of readjusting to civilian life centred upon Leningrad is highly instructive. It reminds us that different societies understand and respond to trauma in different ways. Aspects of the return to civilian life which we might consider traumatic were not seen as such at the time. Although mental health problems linked to war experiences were a medical and social reality in Leningrad, most veterans were remarkably resilient to the problems they faced, and resourceful in the solutions they pursued to resolve them. 1. Tsentral’nyi gosudarstvennyi arkhiv istoriko-politicheskikh dokumentov Sankt-Peterburga (hereafter TsGAIPD-SPb), f. 24, op. 2v, d. 7023, l. 75. This research upon which this paper draws has been generously supported by the British Academy, the Harry Guggenheim Foundation and the Arts and Humanities Research Council. – The website’s editors are grateful for Jennifer Laing’s support in preparing this text for publication. 2. TsGAIPD-SPb, f. 24, op. 2v, d. 7023, l. 75. 3. Tsentral’nyi gosudarstvennyi arkhiv kinofotofonodokumentov Sankt-Peterburga (hereafter TsGAKFFD-SPb) Ar27071, Ar27073, Ar36711 and Ar37081. 4. TsGAIPD-SPb, f. K-598, op. 5, d. 232, ll. 16–17; “Vstrechaem dorogykh voinov”, Smena, 16 July 1945, 2. 5. Tsentral’nyi gosudarstvennyi arkhiv Sankt- Peterburga (hereafter TsGA-SPb), f. 7384, op. 36, d. 226, l. 208. 6. TsGAIPD-SPb, f. 24, op. 2v, d. 8230, l. 1. 7. On the violence of war on the Eastern Front see Bartov, Omer, The Eastern Front, 1941–45. German Troops and the Barbarisation of Warfare, Second Edition (Basingstoke: Palgrave, 2001); Weiner, Amir, Something to Die for, A Lot to Kill for. The Soviet System and the Barbarisation of Warfare, 1939–45, in Kassimeris, George (ed. ), The Barbarisation of Warfare (London: Hurst and Company, 2006), 101–25; Edele, Mark and Geyer, Michael, States of Exception: The Nazi-Soviet War as a System of Violence, in Geyer, Michael and Fitzpatrick, Sheila (eds), Beyond Totalitarianism. Stalinism and Nazism Compared (Cambridge: Cambridge University Press, 2009), 345–95. 8. On the history of the blockade see: Salisbury, Harrison E., The 900 Days. The Siege of Leningrad (London: Secker and Warburg, 1969); Reid, Anna, Leningrad, Tragedy of a City Under Siege, 1941–44 (London: Bloomsbury, 2011); Bidlack, Richard and Lomagin, Nikita, The Leningrad Blockade, 1941–1944. A New Documentary History from the Soviet Archives, Schwartz, Marian (trans.) (New Haven, CT.: Yale University Press, 2012). 9. TsGA-SPb, f. 8557, op. 6, d. 1108, ll .46–7, reprinted in Leningrad v osade. Sbornik dokumentov o geroicheskoi oborone Leningrada v gody Velikoi Otechestvennoi voiny. 1941–1944, (ed.) A.P. Dzeniskevich (Saint Petersburg: Liki Rossii, 1995), 573–4. 10. Cherepina, Nadezdha, “Assessing the Scale of Famine and Death in the Besieged City”, in Barber, John and Dzeniskevich, Andrei (eds), Life and Death in Besieged Leningrad (London: Palgrave Macmillan, 2005), 28–70 (64); Reid, Leningrad, 417–8; Salisbury, The 900 Days, 514–17. 11. Robert Dale, Demobilized Soldiers in Late Stalinist Leningrad: Soldiers to Civilians (London: Bloomsbury: forthcoming 2015). 12. Zubkova, Elena, Russia After the War: Hopes, Illusions and Disappointments, 1945–1957, Ragsdale, Hugh (ed. and trans.) (Armonk, NY. : M. E. Sharpe, 1998), 23–39; Zubkova, Elena, Poslevoennoe sovetskoe obshchestvo,: politika i posvednevnost, 1945–1953 (Moscow: ROSSPEN, 2000), 28–35; and Zubkova, E. Iu. (ed. ), Sovetskaia zhizn’, 1945–1953, Moscow: ROSSPEN, 2003), 308–32. 13. Weiner, Amir, Making Sense of War: The Second World War and the Fate of the Bolshevik Revolution (Princeton, NJ. : Princeton University Press, 2001). 14. Edele, Mark, Soviet Veterans of the Second World War. A Popular Movement in an Authoritarian Society, 1941–1991 (Oxford: Oxford University Press, 2008). See also Edele, Mark, More than just Stalinists. The Political Sentiments of Victors 1945–1953, in Fürst, Juliane (ed. ), Late Stalinist Russia. Society Between Reconstruction and Reinvention (London: Routledge, 2006), 167–92; Edele, Mark, Soviet Veterans as an Entitlement Group, 1945–1955, Slavic Review, 65:1 (2006), 111–37; and Edele, Mark, Veterans and the Village: The Impact of Red Army Demobilization on Soviet Urbanization, 1945–1955, Russian History, 36:2 (2009), 159–82. 15. There is however an excellent study of post-war Leningrad, see Vakser, A. Z., Leningrad poslevoennyi 1945–1982 gody (Saint Petersburg:Izdatel’stvo Ostrov, 2005). 16. Edele, Soviet Veterans, 21–38. 17. 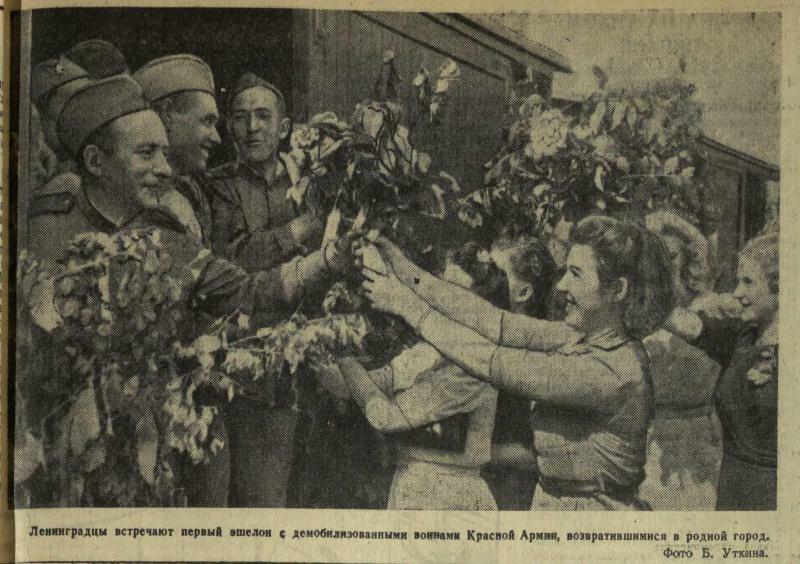 Kirschenbaum, Lisa, “Our City, Our Hearths, Our Families: Local Loyalties and Private Life in Soviet World War II Propaganda”, Slavic Review 59:4 (2000), 825–37. 18. Moniushko, Evgenii D., From Leningrad to Hungary: Notes of a Red Army Soldier, 1941–1946, Glantz, David M. (ed.) Moniushko, Oleg (trans.) (New York: Frank Cass, 2005), 220–1. 19. Steinbeck, John Ernst, A Russian Journal (London: Heinemann, 1949), 12. 20. Steinbeck, A Russian Journal, 12; Werth, Alexander, Leningrad (London: Hamish Hamilton, 1944), 185; Clifford, Alexander and Nicholson, Jenny, The Sickle and the Stars (London: Peter Davies, 1948), 114–15. 21. On the preservation of historic monuments and the city centre: Maddox, Steven, “These Monuments Must Be Protected! The Stalinist Turn to the Past and Historic Preservation during the Blockade of Leningrad”, Russian Review, 70:4 (2011), 608–26; Maddox, Steven, Healing the Wounds: Commemorations, Myths, and the Restoration of Leningrad’s Imperial Heritage, 1941–1950 (Ph.D diss., University of Toronto, 2008). 22. Bidlack and Lomagin, The Leningrad Blockade, 38. Other documents present slightly different figures. For example the report of the commission established to investigate the damage done during the war and blockade calculated that 107.158 incendiary bombs and more than 150.000 heavy artillery shells were fired on the city. TsGA-SPb, f. 9156, op. 4, d. 197, ll. 128–34, reprinted in Dzeniskevich (ed. ), Leningrad v osade, pp. 562–72 (p. 562). Given the situation all figures were presumably approximations. 23. Vakser, A. Z., Leningrad poslevoennyi 1945–1982 gody (Saint-Petersburg: Izdatel’stvo Ostrov, 2005), 71. For marginally lower figures see Arstiutkina, O. N., Leningradskaia partiinaia organizatsiia v bor’be za vosstanovlenie zhilogo fonda (1944–1945gg. ), Vestnik Leningradskogo Universiteta, No. 20 (1964), 17–28 (17); Ruble, Blair A., The Leningrad Affair and the Provincialization of Leningrad, Russian Review, 42:3 (1983), 301–20 (304–5); “Za dal’neishii rastsvet nashego liubimogo goroda”, Leningradskaia pravda, 18 January 1947, 1, “O sostoianii eksploatatsii zhilogo fonda goroda Leningrada i podgotovke ego k zime”, Leninradskaia pravda, 2 September 1947, 2, “Vo Slavy Rodnogo Goroda”, Leningradskaia pravda, 7 November 1947, 3. 24. Arstiutkina, Leningradskaia partiinaia organizatsiia, 17. 25. TsGA-SPb, f. 7384, op. 17, d. 1520, ll. 13–13ob. 26. Builleten’ Lengorispolkoma, No. 20, 1947, pp. 16-17. 27. Krylova, Anna, “‘Healers of Wounded Souls’. The Crisis of Private Life in Soviet Literature, 1944–1946”, The Journal of Modern History, 71:2 (2001), 307–31. 28. White, Elizabeth, After the War was Over: The Civilian Return to Leningrad, Europe-Asia Studies, 59:7 (2007), 1145–61; Peeling, Siobhan, “Out of Place” in the Postwar City: Practices, Experiences and Representations of Displacement during the Resettlement of Leningrad at the End of the Blockade (Ph.D. diss., University of Nottingham, 2010). 29. Leningradskii oblastnoi gosudarstvennyi arkhiv v gorode vyborge (hereafter LOGAV, f. R-4380, op. 1, d. 1211, ll. 4-6. 30. Ruble, The Leningrad Affair, 304. 31. TsGAIPD-SPb, f. 24, op. 2v, d. 7702, l. 52. 32. On the fate of disabled veterans see Fieseler, Beate, “The Bitter Legacy of the ‘Great Patriotic War”, Red Army Disabled Soldiers under Late Stalinism”, in Fürst, Juliane (ed. ), Late Stalinist Russia. Society Between Reconstruction and Reinvention (London: Routledge, 2006), 46–61, and Dale, Robert, “The Valaam Myth and the Fate of Leningrad’s Disabled Veterans”, Russian Review, 72:2 (2013), 260–84. 33. For one problematic attempt to do so see Förster, Alice and Birgit Beck, “Post-Traumatic Stress Disorder and World War II: Can a Psychiatric Concept Help Understand Postwar Society?”, in: Richard Bessel and Dirk Schumann (eds), Life After Death. Approaches to a Cultural and Social History of Europe during the 1940s and 1950s (Cambridge: Cambridge University Press, 2003), 15–35. 34. For important comparative studies of trauma see Micale, Mark S., and Lerner, Paul (eds), Traumatic Pasts: History, Psychiatry, and Trauma in the Modern Age, 1870–1930 (Cambridge: Cambridge University Press, 2001); Withuis, Jolande and Mooij, Annet (eds), The Politics of War Trauma: The Aftermath of World War II in Eleven European Countries (Amsterdam: Amsterdam University Press, 2010). 35. Shephard, Ben, A War of Nerves. Soldiers and Psychiatrists in the Twentieth Century (Cambridge: MA. : Harvard University Press, 2001), xxii. 36. Merridale, Catherine, “The Collective Mind: Trauma and Shell-shock in Twentieth-century Russia”, Journal of Contemporary History, 35, 1 (2000), 39–55. 37. Dale, Robert, “Rats and Resentment: The Demobilization of the Red Army in Postwar Leningrad, 1945–50”, Journal of Contemporary History, 45:1 (2010), 113–33. 38. For debates about trauma amongst Soviet psychiatrists more generally see Zajicek, Benjamin, Scientific Psychiatry in Stalin’s Soviet Union: The Politics of Modern Medicine and the Struggle to Define ‘Pavlovian’ Psychiatry, 1939-1953 (Ph.D diss. : University of Chicago, 2009). 39. Smirnov, E. I. (ed. ), Opyt Sovetskoi Meditsiny v Velikoi Otechestvennoi Voine 1941–1945gg. Tom. 26: Nervnye Bolesni (Osobennosti ikh vozniknoveniia, techeniia, preduprezhdeniia i lecheniia vo vremia voiny), Davidenkov, S. N. and Gorovoi-Shaltan, V. A. (eds.) (Moscow: Medgiz, 1949). 40. An indication of the work of Bekhterev institute can be gained from: Miasishchev, V. N. (ed. ), Nauchnaia deiatel’nost psikhonevrologicheskogo instituta imeni V. M. Bekhtereva za 1946 god (Leningrad: Uchebno-proizvodstvennye masterskie Lenpoligraftekhnikuma, 1947); Miasishchev, V. N., (ed. ), Nauchnaia deiatel’nost psikhonevrologicheskogo instituta imeni V. M. Bekhtereva za 1947. Avtoreferaty nauchnykh rabot (Leningrad, 1948); Averbukh, E. S. and Miasishchev, V. N. (eds. ), Organizatsionno-methodicheskie voprosy sovremennoi neiropsikhiatrii (Leningrad: 1948); Nauchno-issledovatel’skaia deiatelnost’ institute za 50 let. Kratkii ocherk i bibliografiia (Leningrad: 1958). The archive of the Bekhterev Institute, which contains research reports and drafts of publications from this period, is preserved in Saint Petersburg’s Scientific and Technical Documentation Archive, Tsental’nyi gosudarstvennyi arkhiv nauchno-tecknicheskoi dokumentatsii Sankt-Peterburga f. 313, op. 2-1. 41. Merridale, Catherine, Ivan’s War. The Red Army 1939–45 (London: Faber and Faber, 2006); Zajichek, Scientific Psychiatry in Stalin’s Soviet Union, p. 209. For a comparative example of this phenomenon see Jones, Edgar, “‘The gut war’: Functional Somatic Disorders in the UK during the Second World War”, History of the Human Sciences, 25:5 (2012), 30–48. 42. Merridale, “The Collective Mind,” 47. 43. Dale, “Rats and Resentment”. 44. This point was made to me by a number of veterans in an oral history interview with a group of veterans from the Petrogradskii district, 27 November 2007, Disc 3. See also Kirschenbaum, Lisa A., “‘The Alienated Body:’ Gender Identity and the Memory of the Siege of Leningrad’, in Wingfield, Nancy M., and Bucur, Marcia (eds. ), Gender and War in Twentieth-Century Eastern Europe (Bloomington, IN: Indiana University Press, 2006), 220–34.